Brexit is a fact now and is expected to have a significant impact on the economies of the United Kingdom and its key trade partners. One impact area relates to the European Union’s research funding in the form of its current Horizon 2020 Framework Programme for Research and Innovation, as well as ongoing projects funded as part of the previous Seventh Framework Programme. A significant number of universities, knowledge institutes and companies from the UK currently participate in these programmes. Exactly which organizations and projects are potentially impacted, and how are they connected? Network science provides an initial view. Update: added ongoing FP7 projects to the interactive visual as well. You can use the blue buttons at the top of the visual to switch between the H2020 and FP7 networks. Data on all Horizon 2020 and FP7 projects and organizations is readily available as Open Data from CORDIS, the European Commission’s public repository for information regarding EU-funded research projects. 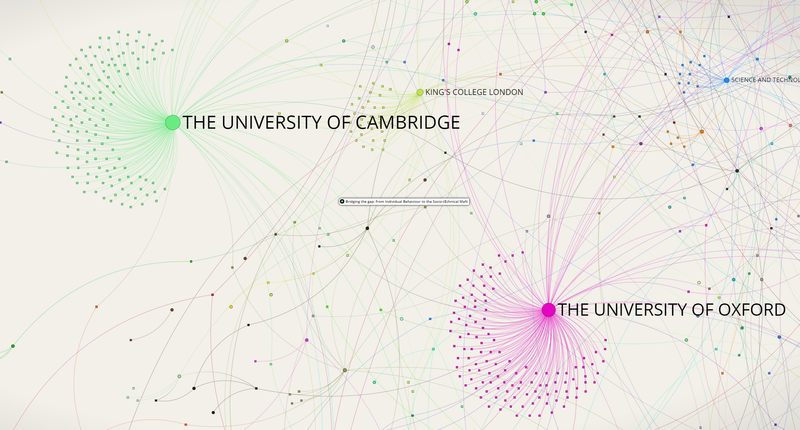 The principles of network science allow us to convert this data into maps of activity by organizations from the UK. Networks are composed of nodes (entities) and edges (the connections between entities) and allow deep analysis and visualization of the underlying structures of research and collaboration. Here, we’ll be connecting organizations which are based in the United Kingdom to all Horizon 2020/FP7 projects which they currently participate in. In network parlor, this is an example of a two-mode or bipartite network, in which two distinct node types are connected whenever they co-appear in the underlying dataset. We’ll be focusing on the largest interconnected cluster of activity here – any disconnected projects and organizations are omitted. FP7 projects were filtered to only include ongoing projects by focusing only on projects which have an end date in 2016 or later. The interactive visualization below allows you to explore the network of projects and organizations yourself. You can search for topics and organizations using the search box at the top left. Clicking a node shows its properties at the right and allows you to view its direct connections as well. Project nodes include a link to the project page on the CORDIS website to read up on all the information associated with that project. Nodes are sized based on their total number of connections, which allows us to quickly see which universities and organizations are potentially impacted most. Node colors are assigned based on a community detection algorithm, which groups nodes with dense connections between them. 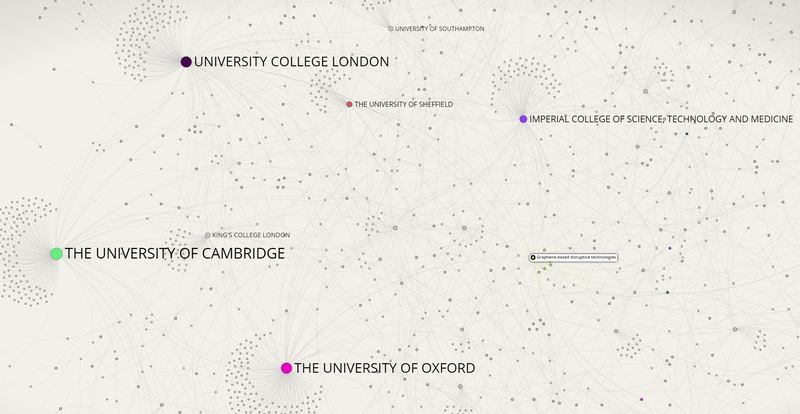 This helps us to get a visual view on the clusters of organizations and projects surrounding key actors. Please note: the interactive visualization is best viewed on a desktop/laptop screen. Mobile viewers are encouraged to view the full-screen version in landscape mode, which can be found here. Insights: Horizon 2020 A first look at the visual immediately shows that the University of Cambridge, the University of Oxford and University College London are potentially impacted most in terms of the number of Horizon 2020 projects they currently participate in. Respectively, these universities participate in 183, 167 and 165 projects. Quite a few projects are characterized by the participation of multiple UK universities and organizations. For instance, Oxford and Cambridge both participate in the project ‘Bridging the gap: from Individual Behaviour to the Socio-tEchnical MaN’. The core of the network consists of a wide variety of projects and organizations which are connected to various other parts of the network. A good example is the project ‘Graphene-based disruptive technologies': many of the leading universities in the UK participate here, with the project being part of the EU’s € 1 billion Graphene Flagship program. Exploring the outer structures of the network provides an interesting view on the lesser-connected projects and organizations. You’ll encounter more business organizations here, including Rolls Royce and TWI at the bottom right of the network. This shows that for-profit organizations are also potentially impacted by the Brexit from a research ecosystem perspective, albeit less than universities or research institutes. Feel free to explore the networks yourself and share any further insights using the comments below! Interesting analysis. Could you tell me what software was used for the interactive graph? Thanks for your comment Eugen. The interactive graph was made using sigma.js, an open-source graph visualization library: https://github.com/jacomyal/sigma.js. The interface was built in-house. Hope this helps.